From the self-proclaimed, non-domestic goddess… I’m the first to admit a few things about myself: I’m lazy, there’s not a domestic bone in my body, really hate cooking and anything to do with the kitchen (but I do love eating really yummy food), can’t stand a dirty kitchen (and the easiest way to keep it clean is to not get it dirty in the first place), hate gardening and anything to do with being outside and sweaty (didn’t I already admit to being lazy? ), and I’m frugal (my sister calls it cheap). 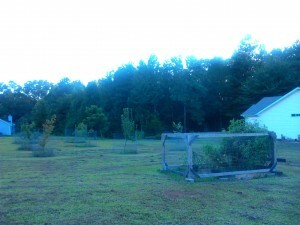 So I grew up in the South, and of course we had a big garden. I always swore that when I grow up, I’m NEVER having a garden. Well, I also grew up eating tomato sandwiches and LOVE them. Unfortunately, grocery store tomatoes may as well be made of wax for all the flavor they have. That left me with learning (all over again) how to grow my own tomatoes. I’m also one of those dirty, rotten, stinkin’, capitalists who really believes that our federal government is gonna be the cause of the demise of the USA. 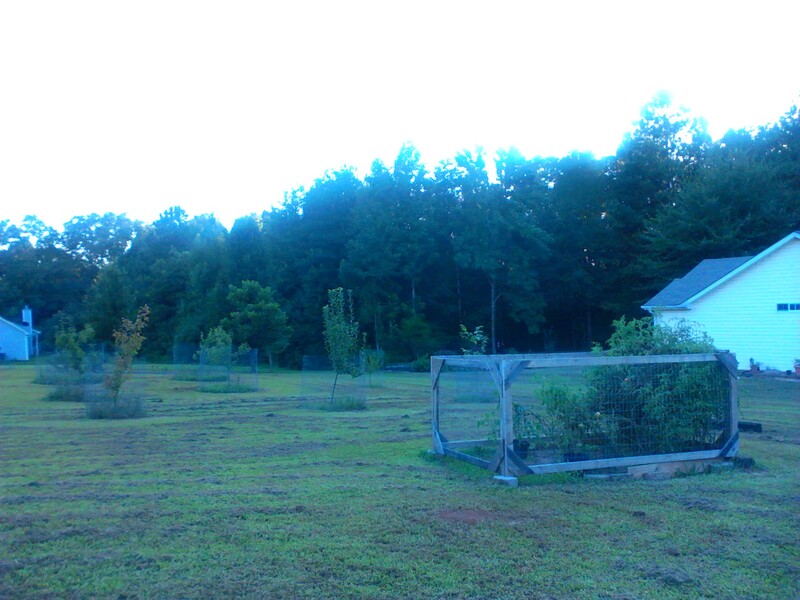 In preparation for the coming economic doom (or zombie apocalypse), I also pushed my husband into buying a home with a little bit of land, on which we’ve been growing tomatoes, and a few fruit & nut trees. This is logical not only for prepping purposes, but also to save money by growing our own. Here we are, two years later, and I’m looking at more tomatoes and apples than I know what to do with, so am being FORCED into learning a new skill: canning. Ok… isn’t this why I pushed for a home with gardening space in the first place? Can’t start prepping without 1) a garden and 2) canning. In a few years, it’ll be blueberries (so far we’ve managed to eat them all – and there were LOTS this year), pears, plums, and figs, too! My first dilemma came a few weeks ago when I was looking at a kitchen counter full of tomatoes and the realization that even I can’t eat that many tomatoes and tomato sandwiches! hahaha So I got out You Can Can (the canning book I purchased, promising my husband that I’d put it to work) and did some research online to find a recipe that was easy enough for me. (I don’t only hate cooking, but am totally lacking in that skill set – dear hubby says I don’t have the patience. Good thing he loves it and is really good at it!) Found an easy recipe, but when I went to the store to buy the ingredients… found a mix! Now THAT’S easier than mixing ingredients. The instructions were simple, too. 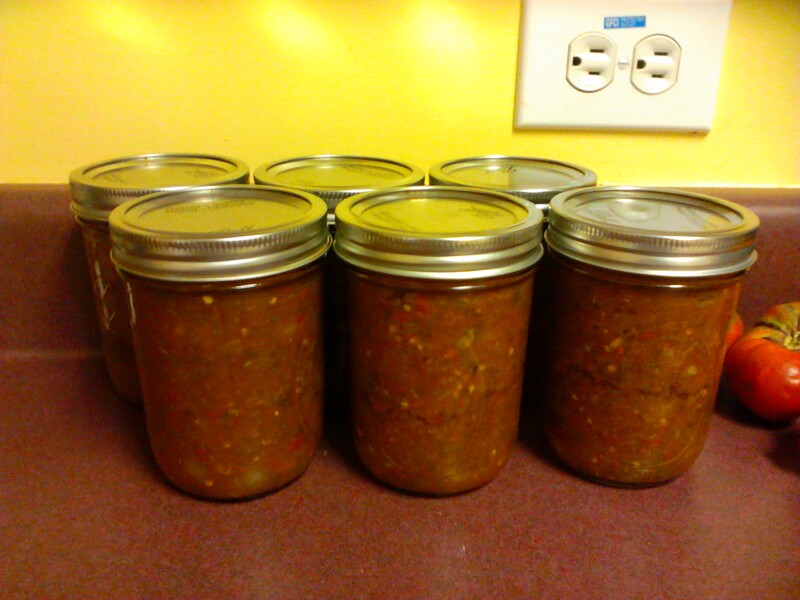 A few hours later, I was proudly looking at my 2.5 quarts of home-made, CANNED salsa! Unfortunately, the mix I got was supposed to yield 5 quarts. After tasting, I was glad it wasn’t 5, because it was pretty bland for salsa. As much salsa as we eat, this will save us some bucks, too! Last week, when I realized the apples were beginning to fall off the trees, I looked up recipes for canning them. Didn’t really know if I wanted to do apple sauce, apple butter, or pie filling. Fortunately, apples are acidic enough that you can simply “blanch and bottle”… meaning they’re just apple slices, so you can use them however you wish whenever you decide. Put up 5 pints of those. Also had 3 “chocolate cherry” tomato vines (which daughter talked me into buying) that were overflowing. This family of 3 can’t eat that many salads! Chopped them up and had 12 cups (the equivalent of 8 quarts or just over 3 pounds). After another 3 HOURS of research, I could not find a salsa recipe that fit – either exactly or by proportion. WHY can’t someone write a recipe formula that says for every so many cups/lbs/qts of tomatoes, one can safely add this many chilies, this much onion, and this much cilantro, etc.?!?!?!?!?!?!? Ya, see, the thing to worry about with canning is that if you want to use the simple “water bath” method, you have to use an acidic food or recipe. This is apparently because there’s a spore called botulism that will grow in your canned food and kill you. But high acid (pH of 4.6 or lower) OR high heat (if you use a pressure cooker) will kill it instead. Some tomatoes aren’t acidic enough (yeah, news to me, too), and apparently chilies and onions (my intended other ingredients) will lower the acid level farther. (Yeah, that sounds odd to me, too, but I’m not the expert scientist on acidic foods.) The research indicated that when canning (“plain old”) tomatoes, just add some lemon juice or citric acid to each jar while filling to ensure proper pH levels (lemon juice: 2 tbsp per quart or 1 tbsp per pint; citric acid: 1/2 tsp per quart or 1/4 tsp per pint). 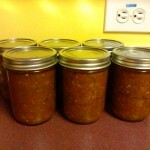 6 of the 7 pints of home-made canned salsa. Hubby & I taste-tested while it was simmering and it was YUMMY! Unfortunately, it’s also so acidic that I got instant heart burn! Fortunately, in all this research, I learned that I can add baking soda to reduce the acid level after opening if it’s still to acidic. I am really amazed to find that canning is so easy! Even the laziest, non-domestic goddess can do it! And if I don’t die of botulism poisoning in a few months, we’ll know that the recipe worked. Or… we’re just lucky! What’s fair? Capitalism or Socialism? Nobody with a pulse can deny that there’s been an ongoing, heated argument in politics and pop-culture that pits “the rich” against “the poor,” the flames of which have been fanned by the Occupy Wall Street (OWS) movement. OWS supporters would have you believe that they’re fighting for the rights of the worker class against the perceived abuses of the “elite.” “Class warfare” it’s being called in some circles. Really? Is it really wealth envy that’s driving this argument? Or is it really a coming tipping point in a centuries-old philosophical discussion regarding the merits of Capitalism vs. Socialism? Which is fair? Socialism or Capitalism? There are elements of our society (the “99%”, the OWS crowd, and our current President among them) who would have you believe it’s Socialism. They would have you believe that in a world where any one person (or group) has the skills, creativity, and bravery to do something extraordinary, that it’s somehow immoral for them to be able to profit from it. And if they should find a way to profit from it, then it’s the government’s duty to force them to “share” that profit with those who possess neither the skills, creativity, nor gumption to attempt anything even remotely exceptional with their lives. That just their mere existence qualifies them as a recipient of the spoils of someone else’s exceptionalism. In other words, they are entitled to impose on someone else’s time, skills, and resources without ever having done anything to earn it. In the world of Socialism, where’s the motivation for the talented to make such an effort? If I know that any extra effort on my part will only benefit someone else, why should I make that effort? Sure I care about people and will go out of my way to help them – IF I feel that they’re deserving of my efforts. But I’m not gonna go out & build a multimillion dollar business for someone else. In fact, statistics prove that employees tend to do only as much work as is required to keep them from being fired. (For proof, just google “how much effort employees,” “shirking,” and “propensity to withhold effort.”) Unless there’s some personal incentive in it for them, they’ll not expend the extra effort (talent) to accomplish better results for their employer. Therefore, I would argue that Capitalism is a better (fairer) plan. When a risk-taker is sufficiently motivated by unlimited rewards (even acknowledging that the risk of great loss exists), they’ll expend their time, effort, talent, skills, and creativity to accomplish what has (up to that time) been deemed impossible. Those vast rewards are realized when the market place determines that Mr. Risk Taker has created something of value and is willing to pay him for it. Of course certain economic conditions will determine exactly how valuable it is, and therefore, how much the general population is willing to pay for it. How is this fairer for everyone else, you ask? First, it’s fair that they receive sufficient value for the money spent on Mr. Risk Taker’s goods or services. Second, it’s especially fair if Mr. Risk Taker is unable to fulfill all the duties required to meet market demand and is forced to hire others to help. Under Capitalism, we love and value our “worker bees.” Somebody’s gotta drive the trucks, run and/or maintain the machines, sweep the floors, type the letters, keep the financial books in order, tend the landscaping, plant & harvest the produce, take our blood pressure, tend to our ailments and healing, etc. The employer who not only provides value to the public, but provides sufficient reward to his valuable worker bees, will have some loyal and hard-working employees. 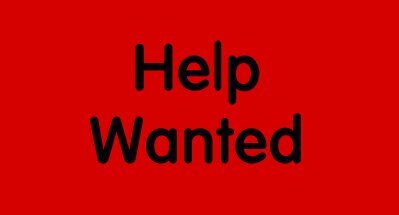 People would rather have jobs than welfare. So those who are rewarded with good jobs have higher self-esteem knowing they’re providing for themselves (and their families). Especially if they have employers who show appreciation through good pay and other intrinsic rewards. In this way, Capitalism is valuing and honoring the population at large: Mr. Working Man. Lastly, it’s fair because, as Margaret Thatcher said, “The problem with Socialism, is that eventually you run out of other people’s money.” “Social programs” are paid for via taxes. If more and more people are “benefiting” from these social programs, then fewer and fewer are paying for them. Why is it deemed more moralistic to demean large portions of the population by forcing them to be recipients of “social” help than it to give them a job in which they can take pride for being a productive citizen? and revenues to pay for the necessary operations of government, and the existential operations of social programs for those with true needs.